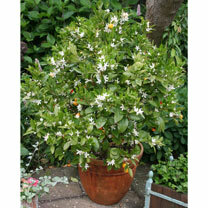 Bring a taste of the Med to your home, conservatory or summer patio with this beautiful little mini citrus tree. Their shiny green leaves, beautifully scented white flowers and vibrant fruit will create a real talking point! The striking bitter orange fruit and fragrant flowers last for weeks and this tree will continue to fruit and flower on and off all year round. Use the fruits orange or green in drinks and cooking. Harvest July-early October. Height 150-200cm; spread 100-150cm. The striking bitter orange fruit and fragrant flowers last for weeks and this tree will continue to fruit and flower on and off all year round. Use the fruits orange or green in drinks and cooking. Calamondin is a cross between the Mandarin Orange and the Kumquat. 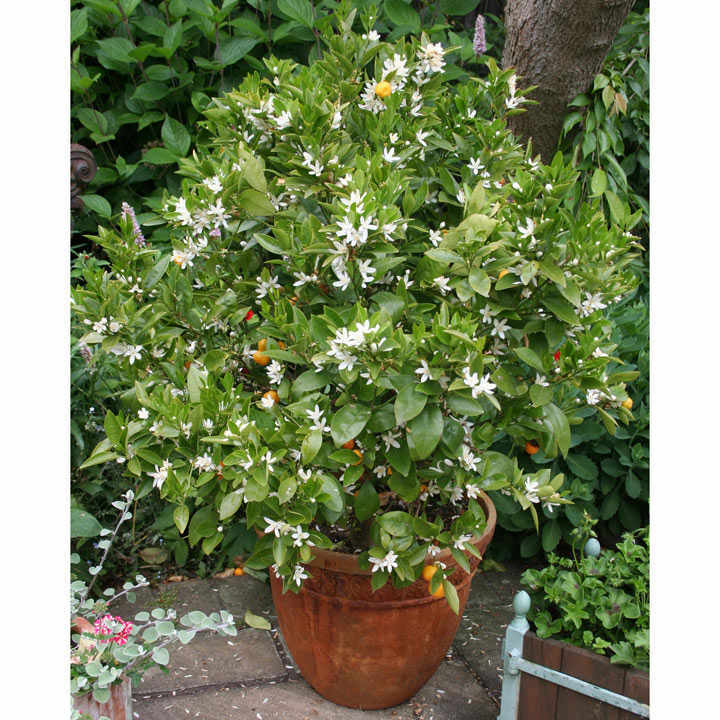 It has a very even and rounded bush growth habit which along with its propensity to flower and fruit in huge quantities makes it one of the easiest and most rewarding citrus to grow in the UK. The small fruits have a very thin skin and it is advised to cut the fruits from the tree rather than to pull the fruits to avoid tearing. The skin is sweet whilst the flesh is very acid, making for a real zing when eaten whole which you can most certainly do. 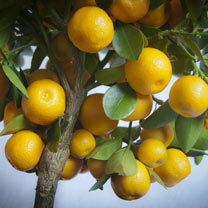 It is very high in vitamin C. Calamondin is self-fertile. It is very easy to cultivate given a suitable free draining soil-based compost. I would recommend mixing in 25% grit. As with most citrus, the roots are comparatively small to the volume of the tree and a tree of say 7 years will thrive in a 15 litre pot. Watering can be set at say once a week during spring and autumn with twice a week in summer. During winter watering should be confined to a maintenance level to prevent leaf shrivel. This applies to all citrus in the UK. It is recommended leaving citrus including Calamondin outside during the winter months so long as the temperatures are not below 5ºC. In that case, a frost-free shed or garage with some daylight will overwinter the plants well, and on days when the temperature is greater than 5ºC they should be placed outside to gain whatever sun they can. Remember that Calamondin fruits are an orange colour from late October through till April and bring a brightness to the garden during those dull days. However, they can be used in dishes when green for the same citrus flavour effect. Calamondin is used extensively in SE Asian cuisine and also as a real kick to cocktails in fancy London bars.!! The leaf gives off a very good flavour particularly to fish. (Try a small handful of leaves inside Gilthead Bream). Calamondin marmalade is magnificent. It is common for a tree of say 7 years to give over 200 fruits per year. Ideal for beds and borders, patio pots and containers, greenhouses. Scented. Prefers full sun or partial shade.